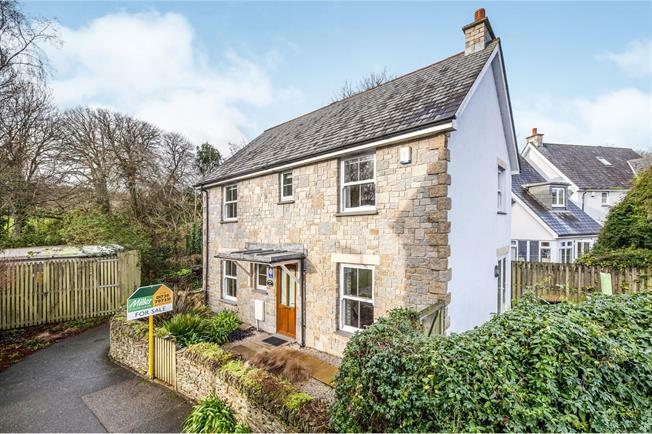 3 Bedroom Detached House For Sale in Hayle for Guide Price £330,000. An attractive double fronted detached house. Accommodation comprises of an entrance hall with a cloakroom , leading off double doors into the lounge with its french doors to the garden. A large kitchen /diner completes the downstairs. Upstairs is a master bedroom with an en-suite and two other bedrooms plus a family bathroom. Outside is a courtyard style garden and a detached garage with a parking space. A light and airy room , double aspect with double glazed French doors to the garden, feature fireplace and a tiled floor, heating radiator. Off the hall is cloakroom with wc and sink, a tiled floor and heated towel rail. With a frosted glass window. The kitchen/dining room is also dual aspect with a tiled floor. The kitchen has a range of base and wall units, a combination of pendant and recessed lighting. A gas hob with electric oven as well as fitted dishwasher and fridge/freezer. There is a stainless steel one and a half basin sink with mixer tap. There is a radiator and both windows. The landing benefit of a useful cupboard. A master bedroom with en-suite and with a fitted wardrobe. The room is carpeted and includes a radiator. There is a door leading to en-suite. A good sized room with toilet, sink, and electric shower with glass door. A tiled floor and a heated towel rail with frosted glass window. A carpeted room with window to the front and heating radiator. A bedroom with a side aspect window, carpeted with a heating radiator. Tiled floor with window to the front and heated towel rail. Sink and toilet with a bath with shower fitment and glazed shower screen. A courtyard garden is ideal for Alfresco Dining , a stone hedge to the front with a wooden garden gate. To the side is another gate and access to the garage which has light and power.